Latest book club stitchette design. Book Club Stitchettes #2 in the shop! Our camera is mostly like that. Pictures of Victor playing in the snow and pictures of homemade ice cream. Of course, it is 40 degrees today, so we might get enough snow melt that we won’t be completely flooded out when spring hits! It was a good weekend for brownies – I know four people in four different states that were making them! I don’t believe I’ve ever commented before, but I just LOVE your book club stitchettes–I can’t wait to order them all. 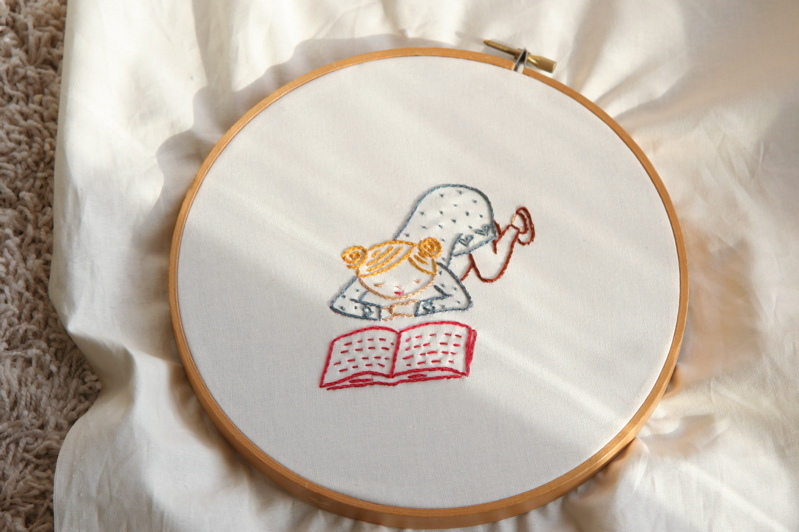 They look *just* like all the positions I find my girls reading in and I have grand plans to make these for their room. Keep ’em coming!! Love the book club stitchettes! This one reminds me of myself as a young girl…always reading. Can’t wait to see the collection!! This little girl is me as a little girl also. Head down in a book, bum up, oblivious to the world.